Samsung might be planning to release a ‘mini’ version of the recently released flagship Galaxy S9 very soon. Samsung stopped making the mini version of the flagship smartphones after the Galaxy S5 Mini. Now, Samsung might bring back the mini versions of its flagship smartphones. A snapshot of the Geekbench benchmarking score has been surfaced which gives merit to this Galaxy S9 Mini rumors and if it’s true then Samsung might bring tough competition to the mid-range smartphone market. 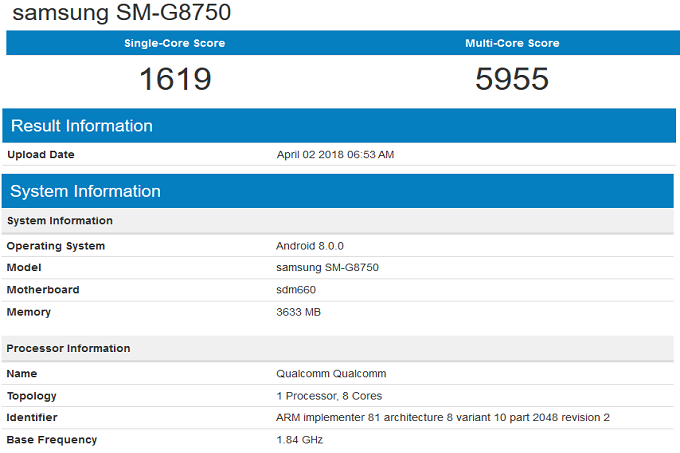 According to the snapshot of the benchmarking website, the benchmarking has been done on April 2 and uploaded with a model number SM-G8750. The smartphone will be featuring 4GB of RAM, run on Android 8.0 Oreo out of the box, and it will feature the Samsung Experience UI on the top. The smartphone might hit the market in June or July. The smartphone is expected to sport a 5 inch Super AMOLED display with minimal bezels. The Galaxy S9 Mini is expected to be powered by a 3,000mAh battery or a 2,750mAh because the flagship Galaxy S9 comes with a 3,500mAh battery. The smartphone scored 1619 for single core performance and 5955 for multi-core performance which is a good score for a mid-range smartphone. The smartphone will be powered by the Qualcomm Snapdragon 660 processor which was recently used on the Nokia 7 Plus. This smartphone on the benchmark might not be Galaxy S9 Mini, it could be some other smartphone like the Galaxy J7 Duos or something like that which is also reportedly launching soon.